These seven Kolkata-based InstaShops have plenty of affordable pieces, so you can stay trendy without getting broke. 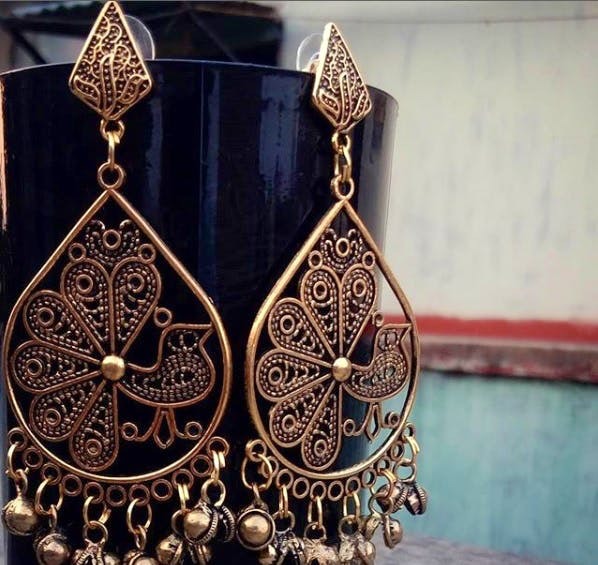 If you are looking to collect earrings that are very chic, Jewel It Up by Priyanka Somani has classy options that can easily be matched with both western and ethnic attire. Starting at INR 600, these earrings are delicate, minimalistic and tastefully designed, and absolutely worth the investment. Quilled jewelry is always special, because we all know how much hard work goes into making each product. From multicolored jhumkas, hair clips and bracelets to rings and dangler earrings, Rup Tan has bright, colourful pieces that are both cute and affordable. How affordable? Well, most pieces range from INR 60 to INR 80! We adore the black and orange bird earrings. North Kolkata-based Terribly Shiny Trinkets might not have the most innovative name, but their earrings, nose pins and necklaces do stand out. Priced as low as INR 45, the collection consists of a lot of traditional, ethnic designs. Whether you are looking for something rustic or contemporary, Handmade For Her has options for every style, ranging from Big Ben and tea kettle danglers to dreamcatcher motifs and Afghan mirror studs. Most pieces range from INR 45 to 130, which is quite reasonable. Rings, neckpieces and plenty of earrings – Jinis Jewellery has everything your jewelery collection needs, for as low as INR 100-180, from mirrorwork studs and dreamcatcher rings to camera necklaces and colourful, geometric -themed statement earrings. Looking for Game of Thrones-inspired Weirwood tree of Westeros earrings? Or perhaps something ethnic in silver? Jhikimiki’s collection – with many pieces priced as low as INR 70 – will keep you coming back again and again. Ankolika’s range of earrings includes lots of jhumka variations and charm piece danglers with owls, shells, dolphins and more. And, you can pick up several pieces for as low as INR 80-150.